doingmercy on a hospital ship in Africa. The photos and stories recorded here are mine (except as otherwise noted) and do not necessarily reflect the views of Mercy Ships. current location: at sea en route to Conakry, Guinea. Imagine you can't see--slowly, but relentlessly, the light dims until finally everything blacks out. And then imagine, that in the time it takes to watch the evening news, a skilled eye surgeon is able to restore your sight. 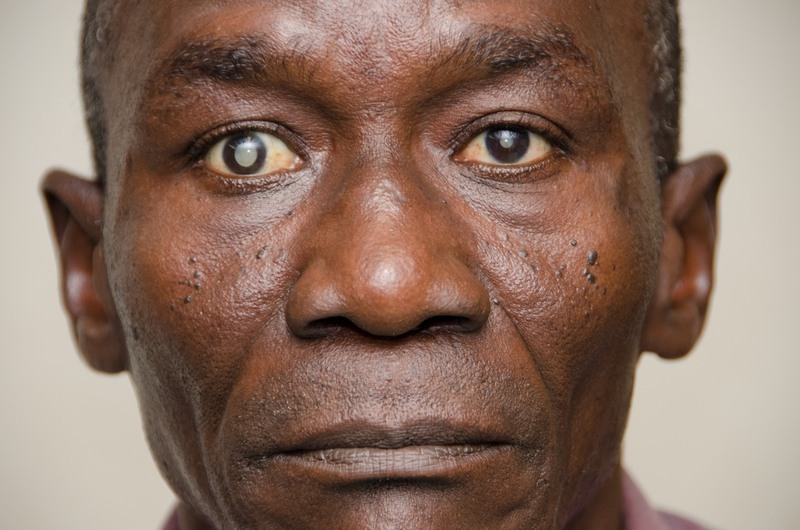 Cataracts are the leading cause of curable blindness. There's a problem though. 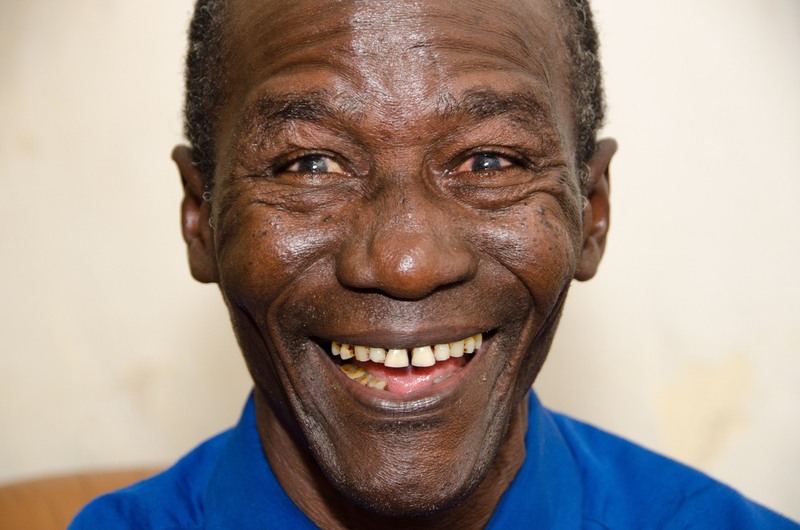 You were born to poor parents in Guinea (or Liberia, or Sierra Leone…) and you have absolutely no access to this 20-minute sight-restoring surgery. 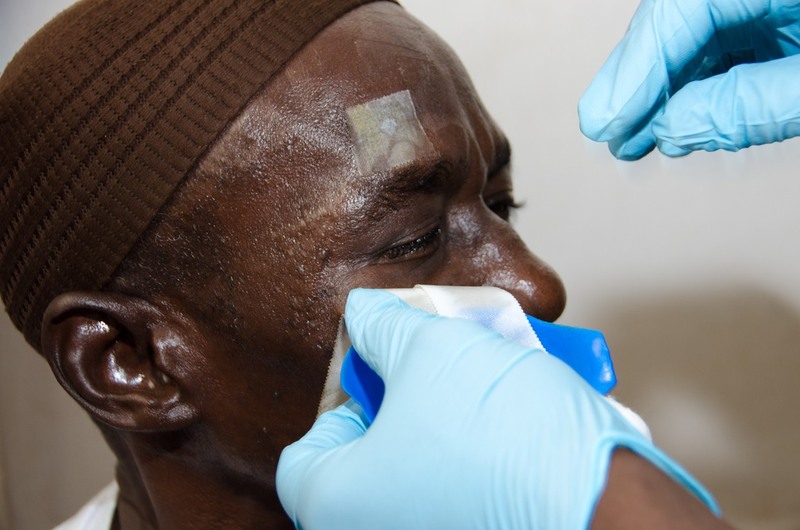 But, Babadi (pictured above) who earns just under $2 per day, is one of the 1,400 Guineans who received eye surgery since our arrival here in August. It's hard to imagine what it must be like to be blind. 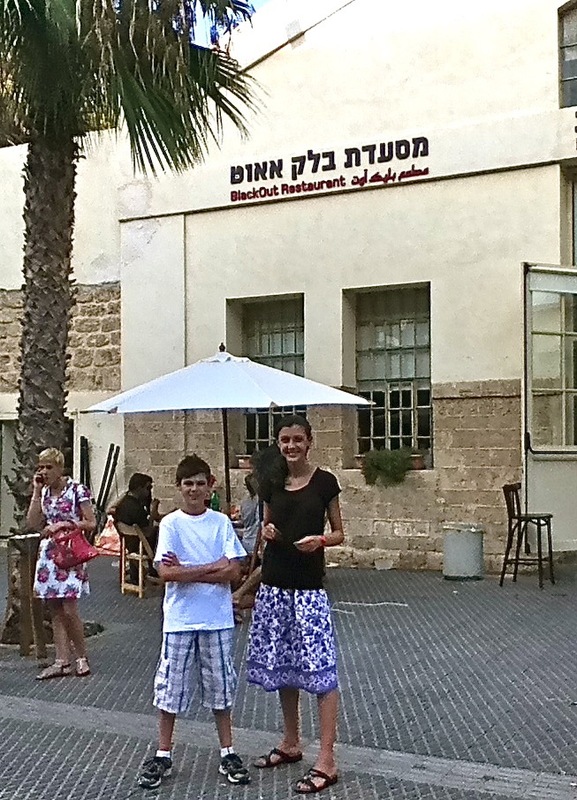 A few years ago, Carys, Wesley and I had dinner at a remarkable restaurant called Black Out in the ancient port city of Jaffa. You know, the place where the prophet Jonah decided to make a runner… Black Out is a specially designed space built inside of a large warehouse. All of the waitstaff are blind and so, in addition to serving food, they act as guides for their seeing guests--who in the absence of light, are themselves now blind. We arrived while it was still light outside and Shira, (not her real name) a pretty woman in her early twenties, met us at the door of the restaurant. She instructed us to follow her by forming a human-chain and immediately we plunged into total darkness. Not a glimmer of light--not even the hands on a luminous watch dial is allowed inside Black Out's inky interior. Shira led the three of us through a labyrinth of twists and turns to our table using a combination of voice and touch. Once seated - and obviously there are no menus, Shira brought a pitcher of water and three glasses. She taught us to put our index finger just over the rim of the glass, so that as we poured the water we would feel when it was time to stop. She then further cautioned, "When you're finished with the water, be sure and put the pitcher next to the wall so you don't knock it over." During our pre-set meal (and the cooks, thankfully, are not blind) Shira answered our questions about what life was like for her -- all the while helping us to to manage a meal in the dark. At some point in our conversation I mentioned (of course) that we live on a mercy ship and because of the generous donations of countless individuals, corporate sponsors and governments, we are able to provide free surgeries for those who cannot afford, or access, specialty surgical care. Specifically, I told her about people, like Babadi, who are blind due to removable cataracts. I thought this would be a point of contact between us. I should have just left it alone and enjoyed the experience, because Shira was not impressed. The best I could figure was that it was the word mercy that changed the atmosphere from pleasant to tense. For Shira, it made her feel patronized. She said that it sounded like we help poor undeserving blind people who cried out to us for mercy and though we responded, by our own self definition, we did not think that they merited this help. It wasn't that she questioned the act of providing free surgeries, but she challenged the integrity of the meaning of mercy in our context. It was the strangest experience. I wanted to explain, to get back on the right side of the conversation, but I found it impossible to re-connect, because I could not see her face or read her eyes. Now who was handicapped? Shira continued to be polite, but distant; Gone was her earlier warmth and energy. I've thought about Shira ever since. And I've thought about something else; I've thought about Justice. Most dictionaries define mercy as compassion or forgiveness shown toward someone who it is within one's power to punish or to harm. By contrast, justice is the quality of being fair and reasonable. So which is it? What do you think? Are we offering mercy, or are we doing justice? "I reckon that 'mercy' is what God offers to us -- to ALL of us as human beings. Most of us do not 'deserve' any of the good which has come our way. All that is blessing and good is MERCY from God. 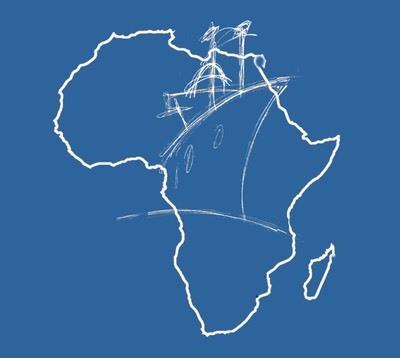 I see the 'mercy' in Mercy Ships as a reflection of the grace and heart of GOD -- not as a statement regarding the merit or 'power' of those who work on the ship. Having therefore received of HIS MERCY -- is it not incumbent upon us to pass that on -- to DO JUSTICE, as exhorted by the Hebrew prophet Micah -- to seek to amend the wrongs and ills around us?" Mercy: by grace God to human. Justice: by grace, human to human. 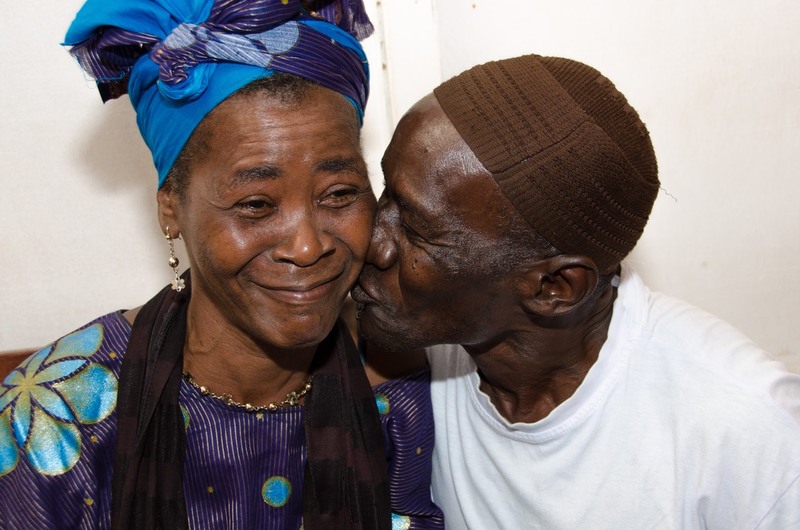 Babadi sees his beautiful wife again for the first time in a long time! "I was blind but now I see"
© Susan Parker 2016 All rights reserved.